NASHVILLE, Tenn. -- From catching an up-close look inside a state-of-the-art recording studio where many today's hits are produced to gracing the stage at "the mother church of country music," 11 Indiana State University students recently got an insider's view of Music City. 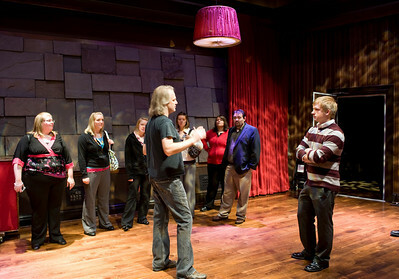 The students, members of Indiana State's Music Industry Association or music business majors, experienced several aspects of the industry, ranging from recording studios to the stately Schermerhorn Symphony Center, the historic Ryman Auditorium and the city's many live entertainment venues. For senior Ashley Martin, a music business major from Fort Wayne, the journey was different than past trips. "This was my first time coming to see the music aspect in Nashville," she said. "I've been here as a tourist several times before, but to see the real-world applications of the things we don't get to find in the textbook," Martin said. One stop was Blackbird Studio, owned by John McBride and his wife, country music singer Martina McBride. In addition to Martina, artists such as Faith Hill, Tim McGraw, Mariah Carey, Brad Paisley, Jon Bon Jovi, The White Stripes, Kings Leon, Rascal Flatts, Ultra Bridge and Keith Urban have recorded or mixed recordings at the studio, said Mike Simmons, co-manager of Blackbird's pro audio rental division. "The best of the best are here recording or editing every day," Simmons, who played in Peter Frampton's band, added. Being able to see Nashville's hottest studio up close struck a chord with Sam Lewis, sophomore business administration major from Evansville. "Just the whole experience of seeing a place that I can relate to -- hearing the White Stripes and the Kings of Leon and Martina McBride and all these other big-name people I actually know, and that I own the records," Lewis said. Blackbird Studio is home to a rather unique studio with interesting decor. 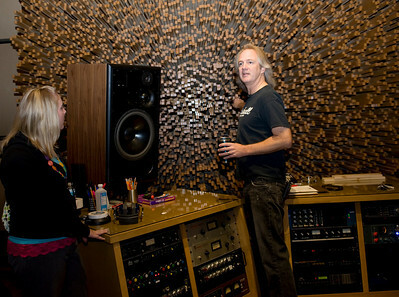 Studio C, built by producer, recording engineer, audio equipment designer, and multiple Grammy award winner George Massenburg, the multi-channel mixing room's walls and ceiling are entirely composed of wooden rods of varying length standing perpendicular to the walls and ceiling themselves. "It's the first studio of its kind," Simmons said, adding the studio offers "the perfect listening environment." "They do a lot of surround sound mixing in here because the sound is so good," Simmons said. "It's booked every day." "We had three records in the Top 10 at once six months ago," Simmons said, adding portions of the NBC Sunday Night Football opening featuring Faith Hill were shot and recorded at Blackbird. The studios at Blackbird have been given the "star" touch, according to Simmons. "Martina does all the interior design," he said. "She has really good taste in addition to singing." The experience at Blackbird made at least one student think twice about what area of the music business he wants to pursue. "From seeing how these people work, seeing what goes in to making these tracks in the recording business, it is convincing me more and more each minute that I want to go in to the recording business," said David Thompson, a sophomore music business major from Carmel. "This has truly been a gift for me, to come and see Blackbird Studios." Inspired by The Beatles, Blackbird was born from a house John McBride purchased in January 2002. The facility now encompasses a city block, and includes seven studios as well as audio and equipment rentals. While Blackbird is one of today's hottest studios in Music City, Indiana State students also visited a popular recording studio from the past -- historic RCA Studio B, once the recording home of such titans as Elvis Presley, Roy Orbison, Chet Atkins, Eddy Arnold, and the Everly Brothers. Built in 1957, Studio B first became known as one of the cradles of the "Nashville Sound" in the 1960s. A sophisticated style characterized by background vocals and strings, the Nashville Sound both revived the popularity of country music and helped establish Nashville as an international recording center. Studio B may not be cranking out the hits anymore, but it serves as a learning laboratory for students at Belmont University's Mike Curb College of Entertainment and Music Business, who utilizes it to study recording fundamentals. While Studio B reflected on Nashville's past, a visit to the city's most popular venue combined the past and the present. A National Historic Landmark, the Ryman Auditorium was built as a church in 1892. It served as the home of the Grand Ole Opry from 1943-74, before undergoing a major renovation in 1994 and becoming home to the Grand Ole Opry once again in 1999. Despite the renovation, some features were left untouched -- the exterior of the building, the 60-year-old stage and the building's original church pews, which are 116 years old. The Ryman continues its more-than-100-year music tradition by offering the best in live entertainment. Musicians ranging from Roy Acuff and Patsy Cline to James Brown and Marian Anderson have performed on the Ryman stage. Hollywood stars such as Douglas Fairbanks, Katherine Hepburn, Tallulah Bankhead, Orson Wells, Tyrone Power, Bela Lugosi, Rudolph Valentino and Mae West have also taken the stage. "We continue to be an important venue to performers," said John Dowell, museum supervisor for Ryman Auditorium. Current recording stars such as Bruce Springsteen, Sheryl Crow, Coldplay, Dave Matthews, John Mellencamp, Modest Mouse, Trisha Yearwood, Gretchen Wilson, Harry Connick Jr., Keith Urban and Diamond Rio have also performed at the legendary facility. "No two concerts are alike," said Brian Wagner, marketing manager. 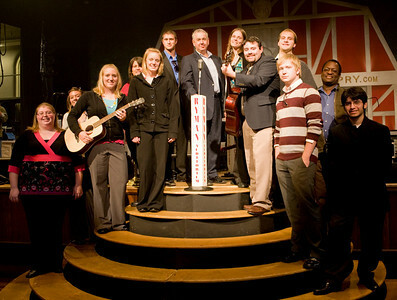 For country music fan Amanda Heshelman, a junior music business major from Plainville, visiting Ryman was pure magic. 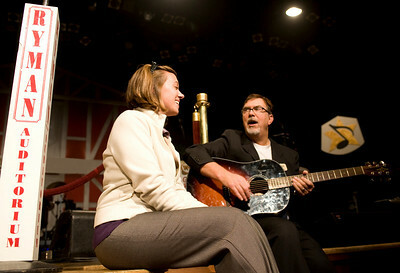 After posing for a group picture on the historic Ryman stage, she sat on stage and sang, accompanied by Dowell. "You just don't get this in the classroom," she said. You can talk about it, but until you really see it and see people in the environment working and how things flow and everything, it brings a whole other element to it." Nashville may figure into her future after she graduates from Indiana State. "I have been thinking about Nashville, just because I like this area and I like country music. I'm really into contemporary Christian music and a lot of that happens here," Heshelman added. Jon McKinney, senior aviation technology major and a member of Indiana State's Music Industry Association, appreciated the trip in a different level -- as a musician. "The recording studios are what got me excited," he said. I really enjoyed Blackbird Studio, seeing where the hits are produced that we hear on the radio today." "The music industry is always about people. It's about the places. Nashville is definitely a hot spot," McKinney added. 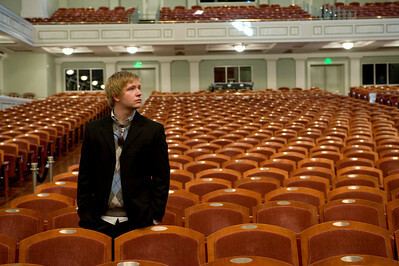 Students also received a tour of Nashville's newest venue, Schermerhorn Symphony Center, home to the Nashville Symphony. The 197,000-square-foot neo-classical structure opened in 2006 and was inspired by some of the world's great concert halls. The shoebox designed 1,844-seat Laura Turner Concert Hall is one of the few halls in the U.S. to feature natural interior light through 30 special soundproof windows. Freshman Ory Maxwell of Winamac, gained a lot of insight during the two-day trip. It's been a really good experience," he said. "I've learned a lot, just being here, knowing how much history and how much music goes on here, it's just been a really great experience." "I think it's a big thing for freshman to get involved," Maxwell said. "It's meant a lot to me because this is something I might want to be doing in my future." Lewis said seeing and experiencing the industry first hand complements what he learns in the classroom. "In music business classes we learn about all the different aspects of the arts/entertainment industry and you wonder "how does this relate" but to see people actually doing the jobs that we cover in class and it makes sense," he said. Indiana State's music business program has been designated a Program of Regional Distinction as part of the university's Distinctive Programs Initiative. Funded in part by a gift from the Lilly Endowment, the initiative is intended to strengthen programs with national or regional reputations for quality, and build programs that have the potential to achieve that status. From catching an up-close look inside a state-of-the-art recording studio where many today's hits are produced to gracing the stage at "the mother church of country music," 11 Indiana State University students recently got an insider's view of Music City.